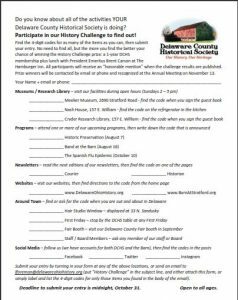 Participate in the DCHS History Challenge to qualify for a 1-year DCHS membership,plus lunch at Delaware’s Historic The Hamburger Inn with President Emeritus Brent Carson. The Delaware County Historical Society wants the community to be aware of all the activities we are involved in from our free programs, to our museums, to our on-line presence, plus so much more. Instead of telling you, we challenge you to find and “taste” our Delaware County history activities. You will have fun, perhaps learn something about our community, and you might even win a free lunch. The History Challenge is made of different parts. Each part of the challenge has a corresponding “secret” code. You collect the 4-digit codes by attending the programs, visiting our historic buildings, going on-line to our websites or social media pages, etc. Take your time, the challenge runs from August 1 until October 31. The History Challenge items, plus hints on how to find the codes, are listed on the entry form. Fillable Form Document Download Entry Form Here. either attach the entry form,or simply label and list the codes that you found in the body of the email). There is no need to find all of the codes, however the more codes you find the better the chance that your entry will qualify for the prize drawing. Qualifying entries will be determined based on the overall level of participation. Once all submitted entries have been evaluated and after the deadline which is midnight, October 31. The qualifying entries will be put in a hat, and President Emeritus Brent Carson (“Mr. Delaware”) will randomly select 2 lucky winners, who will both get free 1-year memberships (new or renewals), plus lunch with him at the Hamburger Inn (one of Delaware’s historic restaurants, in business since 1932). Prize winners will be contacted by email or phone. They will also be recognized at the DCHS Annual Meeting on November 13. The challenge is open to all ages. All participants will receive an “honorable mention” when the challenge results are published online and in the Courier newsletter.